"Bounty Hunter Blood Shepherd" is the fifty-third episode of the Yu-Gi-Oh! VRAINS anime. It first aired in Japan on May 23, 2018. Blood Shepherd challenges Playmaker to a Duel. He manages to figure out Playmaker's strategy, and uses his "Drone" Deck to perform a series of combos to overwhelm Playmaker and seal off his strategy. Blood Shepherd Normal Summons "Drone Pawn" (600/0). If Blood Shepherd controls no other monsters, "Pawn" cannot be destroyed by battle. At the end of the Battle Phase in which "Pawn" was attacked, Blood Shepherd gains LP equal to the battle damage taken during that Battle Phase. Blood Shepherd Sets a card. Playmaker Normal Summons "Clock Wyvern" (1800/1000). As "Clock Wyvern" was Normal Summoned, Playmaker activates its effect, halving its ATK to Special Summon a "Clock Token" (0/0) ("Clock Wyvern": 1800 → 900 ATK). 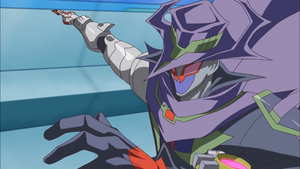 As Playmaker controls a Cyberse monster, he Special Summons "Backup Secretary" (1200/800) from his hand by its own effect. Playmaker uses "Backup Secretary" and "Clock Wyvern" to Link Summon "Elphase" (2000/↑→) to the Extra Monster Zone. Playmaker uses the "Clock Token" and "Elphase" to Link Summon "Shootingcode Talker" (2300/↑←↓) to the Extra Monster Zone. As the Link Summoned "Elphase" left the field, Playmaker activates its effect, Special Summoning a Level 4 or lower Cyberse monster from his GY. He Special Summons the Level 4 "Clock Wyvern" (1800/1000) to the zone the bottom-center Link Arrow of "Shootingcode Talker" points to. As he controls a "Drone" monster, Blood Shepherd activates the Continuous Trap Card "Capture Drone", which lets him negate the effects of a Link Monster Playmaker controls and prevent it from being Tributed or used as Link Material for a Link Summon. He targets "Shootingcode Talker". While Blood Shepherd controls "Capture Drone", Playmaker's Link Monsters cannot attack. Playmaker Sets a card. Blood Shepherd uses "Pawn" to Link Summon "Battledrone Sergeant" (800/↓) to the Extra Monster Zone. Blood Shepherd activates the effect of "Capture Drone", Special Summoning a number of "Drone Tokens" equal to the Link Rating of the targeted monster. "Shootingcode Talker" is a Link-3, so he Special Summons three "Drone Tokens" (0/0) in Defense Position. Blood Shepherd uses the three "Drone Tokens" to Link Summon "Battledrone General" (2400/←↓→) to the zone the bottom-center Link Arrow of "Sergeant" points to. This page was last edited on 6 July 2018, at 02:01.